I like to think that in the world of Warcraft (pun intended) this is how they get you hooked on Hearthstone: Heroes of Warcraft. In our own little world it is a whole lot easier; Hearthstone is free to download and play, and is so thrifty on system power that it could probably run on a potato. Hell, it runs on my computer, which is basically the same thing. 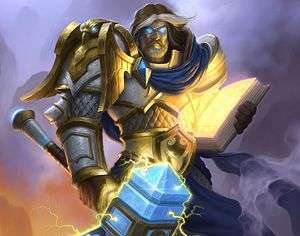 As that silent protagonist in my dream sequence would discover once he sauntered over to the raucous crowd of Hearthstoners – that name might not catch on – Hearthstone is a collectible card game, set within Blizzard’s Warcraft universe. In many ways it seems to share a common ancestor with Magic: The Gathering, but Hearthstone is a beast all its own. That might not seem the case at first glimpse. 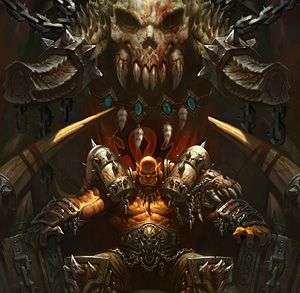 The first stage is picking a hero; there are nine characters taken from throughout the Warcraft universe. At first there is only one choice: Jaina Proudmoore, the Mage class. Defeating the other heroes in the practice mode – in which you play against the Innkeeper – unlocks them for you to play. Each hero has two things going for them: their set of unique cards and their hero powers – an ability that is different for each hero. Some, like the Shaman or Paladin classes, are designed to help gain an advantage with board control by summoning a cheap minion onto the field. Others, like the Hunter or Mage powers, damage the opponent directly. As you play more matches with a hero, they level up. As the loading screen occasionally proclaims, your hero’s rank is directly proportionate to your free time, though there is a level cap of sixty which, I believe, reflects the level cap in the base game of World of Warcraft. As with most card games, matches are turn based. During each turn the hero gains a mana crystal – starting from a single crystal and capping at ten – which are used to play cards. There are three styles of card: minion, spell and weapon cards, any of which can range from zero mana crystals to play, making them essentially free, to ten full crystals. The idea of the game is to use those cards to bring the opponent’s life total (which starts at 30) down to nothing. Minions can attack the hero directly, spells can similarly deal damage, and heroes can even attack each other by equipping weapon cards. Minions come with two values: health and attack, both of which are relatively self-explanatory. Health is the amount of damage a minion can take, while their attack is the amount of damage that they can deal. Many minion cards also come with additional effects, either when summoned or when destroyed, which can range from healing friendly minions, dealing damage or limiting the targets of your opponent’s attacks. For most people who have a working knowledge with a collectible card game such as Yu-Gi-Oh, the Pokémon trading card game, or Magic, Hearthstone will feel immediately comfortable, like an old friend that you haven’t seen in a while. Some things have changed since you last saw them – and Hearthstone certainly has its own style, strategies and methodology to learn – but the time it takes to get to know them better is a pleasure in its own right. For those who don’t play much in the way of collectible card games, there has been a special effort made to make the initial stages of play welcoming. You’re particularly unlikely to come up against a master player, even if you decide to leap right into ranked play, so you should have plenty of time to find your feet. There are three game modes to get into once you are feeling comfortable: play mode, which encompasses ranked and casual online matches, practice mode, which puts you up against the Innkeeper, and my personal favourite mode, the Arena. In ranked matches you play for stars to gain rank. You start at level 25 – also known as Angry Chicken – and can get up to legend ranks, which are above rank 1. Casual play doesn’t have any tangible reward, apart from the wins, but is great for levelling up heroes – you get extra experience for playing human opponents – or testing out crazy new decks. In Arena, you still play against human opponents, but instead of using a deck that you have lovingly crafted from your own cards, you instead draft cards from sets of three options that you are given. This makes you build decks on the spot and can be hugely difficult to do effectively. Furthermore, if you don’t get it wrong it can quickly come crashing down on your head; three losses will see you booted from the Arena. If you can do it effectively, however, there are big rewards to be had. Every win transforms your Arena key and improves the reward you get at the end of your run, which will be explained later. Although it might feel familiar when you start playing, one of the things which sets Hearthstone apart is the personality that it brings with it. Upon starting the game you are treated to cheerful music and quiet babbling in the background, and are greeted by the Innkeeper with increasingly familiar lines. Each hero greets each others with taunts upon starting a match, and throughout these battles you are given the option to emote; there only six options, but having your hero say something witty at the right time can (or should) bring a smile to most faces. One of the nicest touches is that, among the host of cards that the heroes have access to, there are dozens of characters from throughout the universe. Each of these characters hasa different sound clip that plays when they are summoned, some of which are pretty fun – “This is our town, scrub” – and others you just hope you never have to hear, heralding, as they do, a card that is particularly powerful. 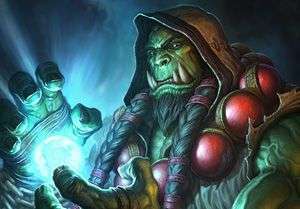 Hearthstone is beautifully and unashamedly a videogame. In contrast to more sparsely presented digital versions of card games, this is designed exclusively as a digital game, which allows for wonderfully presented arenas in which to battle, summoning animations that are unique to cards, and spell animations that are simultaneously lovely and frustrating. Card art is also gorgeous, and is easily enlarged to show off just how attractive many of the cards are. Hearthstone also takes advantage of its medium to make a far heavier use of randomness than many physical games would be able to implement. It can be frustrating on occasion, as sometimes it feels like things come down to luck more than skill but, equally, it can create amazing moments or matches that are incredibly exciting to play. There is, however, a catch. Hearthstone is free to play, and although Blizzard have refrained from going down the horror F2P route and having expendable energy or limiting you to a certain number of matches a day, the free to play elements are impossible to escape. Simply put, the free to play elements are one of the most important elements of Hearthstone: the cards. When you start playing, there are a number of cards available to you, with each hero boasting around ten free cards unique to them. On top of those freebies, they unlock slightly rarer unique cards every two levels up to level ten. Once these cards are unlocked, you have enough to make a decent custom deck that should hold up better than a the stock deck, but if you really want to start climbing the ranks then you need to begin digging into the expert cards, which are only obtainable through expert packs… and that’s where Blizzard are planning to make their money. There are only two ways to get expert packs: buying them in the store – for coins, the Hearthstone currency, or real money – or winning them after an Arena run. My method of choice is the Arena, as it tends to hand out at least one expert pack per run and you get to play some mental decks, but simply buying a couple of packs in the store is equally viable. Doing this will cost about 100 gold per pack – or, if you’re using real money, a pair of packs will cost you £1.99, with the pair being the smallest amount you can buy at a time with cash – while the Arena costs 150 gold – or £1.49 – but comes with the added bonus of potentially winning some amazing rewards. That may not sound like too much of a strain on the bank balance, but when you take into account the fact that at last count there were over 450 cards it quickly becomes clear that getting all of them could be rather expensive, should you choose to take that route. Of course, you don’t have to pay real money; there are a couple of ways to earn gold by simply playing the game. Well, by winning at least, as every three wins in play mode nets you 10 gold, which initially seemed a bit low to me, but now that I am winning consistently I am fairly happy with it. There are also daily challenges to complete, which reward you with about 40 gold a time. You can also stack up three daily challenges at once, so if you can’t play for a few days there is a nice stash of winnable gold awaiting you on your return. The other way to get a decent amount of gold at a time is through the Arena, because once you get the hang of building decks that get a few wins you’ll start hitting the win threshold, meaning you’re rewarded with gold. As a player who is fairly inept at this, I’ve only hit that threshold once, but it can certainly be done. Basically, if you don’t want to put any money into Hearthstone, you really don’t need to. Here’s the thing though. If you choose not to put any money into getting cards, you will reach the point where you begin to plateau in the rankings, battling through matches where opponents have rare cards which can cause massive damage to your deck, held together with spit and blue tac as it is. Even if you win those matches, there is no experience bonus to make you feel better about having to face that ridiculous deck. In fact, once you start reaching the higher ranks, Hearthstone can occasionally come off as a tad unrewarding, especially if you have the bad luck to come up against a few decks that are particularly heavy in rare cards. By the time you hit the lower end of the middle ranks, you’ll see some of those cards far more than you would like. Often, it gets frustrating, especially if you lose a match to the same card three or four times in a session. Sometimes I feel that it is a shame that Blizzard haven’t given people the option to pay a set price and simply get the full game, cards and all, because once you have a few interesting cards deck building becomes an enjoyable experience. Each hero lends itself to their own style of gameplay, and building decks which take advantage of those strengths or weaknesses (or do completely crazy things) is loads of fun. Winning matches with decks that you thought would be fun but utterly crap is brilliant, and throwing together decks for specific challenges is an equally enjoyable mix up. Equally, the potential that Hearthstone has for depth – because, make no mistake, there is a ton of depth to it, no matter how welcoming it is – is hamstrung by the need to grind your way to cards, or just pay and hope for a lucky set of expert cards. Hearthstone as a card game is hugely enjoyable; welcoming from the very start, there are layers upon layers of depth that will take weeks and months to get your head around. It is well presented, with lovely animations and environments, and makes full use of the fact that it is a digital card game to allow for crazy and random card effects. In the Arena it has one of the most enjoyable game modes a card game could come with, and the rewards it gives you are satisfying. As enjoyable as it is, it does suffer from its own free-to-play nature, but even the frustration that all that grinding can foster is balanced by the sensation of satisfaction when you pull out a big play and close a match. It also never forces you to the point where you feel you have to pay which, allied with the knowledge that you’ve built this deck from cards you’ve had to work to earn, makes the endeavour feel worthwhile and helps ensure that once Hearthstone has its hooks in you, they’re in deep. In all, this is without a doubt the best free to play game I’ve ever come across. I’ll be playing it for a long time to come and, who knows, I might even drop a bit of cash on it. If I do, it will have earned it. If you like card games, then you’ll probably like Hearthstone. It has its own foibles, but then so does any game, and this one is free to play, so what do you have to lose? Speaking of which, don’t be put off by the fact that it is free to play. It’s very fair, never pressures you into paying for anything and, under the right circumstances, grinding can feel pretty rewarding, especially when you can conclude a session with an epic Arena run. It doesn’t hurt that Hearthstone is particularly pleasing on the eyes and ears, especially if you know a little about Warcraft lore. Thrall’s “For Doomhammer” still gives me a little flutter of joyous nostalgia, and I’ve played a bunch of matches. Oh, and there’s a Leeroy Jenkins card.